MAHI CHANDRA MIRI, whose appear-ance in the then dwindling Ka-ziranga game reserve gave it a new lease of life, was born in 1903 at village Alimur of Dhakuakhana in Lakhimpur district. Mahi Miri’s father was Doley Miri, a leading man of his community. He was a disciple of Pitambar Dev Goswami of Garmur Satra of Majuli. Although he was uneducated, he encouraged his sons to pursue higher education.Mahi Miri was brought up in the midst of scenic beauty of nature that shaped his young mind. Tall and handsome, he loved outdoor sports like snake catching and different types of games that were in vogue in those days. Mahi Miri was admitted in Sivasagar Town Government HE School. A makeshift thatched cottage was built by his father on a plot of hired land at Sivasagar where Mahi spent his school days along with his younger brother. In 1923, he passed his matriculation exam with flying colours and got admitted in Cotton College, Guwahati. He stayed at Cotton Hindu Hostel 3rd Mess where he met Dr Hiranya Bhuyan, who went on to become the principal of Cotton College, late Harendra Nath Baruah, an illustrious journalist, Punyeswar Sarmah, former mouzadar of Japihugia of Sibsagar district, and many other illuminaries as his fellow boarders. Sarmah, now 103 years old, while recollecting his fond memory of his hostel days, told me that his senior hostel mate Mahi Miri possessed a commanding personality. So much so that junior boarders feared to walk beside his room. He was loved and respected by all the boarders. He was a good athlete and a tennis player. Legendary Prof PC Roy, who was a sportsman par excellence, loved Mahi and sometimes used to play with him in the tennis court between the fourth and the fifth block of the hostel.Besides being a brilliant student Mahi Miri was soft spoken, well disciplined and always regular in his studies. He passed BSc from Cotton College securing second class 14th position in Physics (honours) in 1927. This was indeed an academic achievement so to speak for Miri, since Calcutta University of those days included a vast geographical area including undivided Bengal, Bihar and Orissa.On January 4, 1929 Simon Commission visited Shillong. A memorandum was submitted to the commission by a deputation representing the interests of the depressed and the tribal communities of the province. Headed by Rai Saheb Sonadhar Senapati, the eight-member deputation included Nila Kanta Hazarika (father of Dr Bhupen Hazarika) and Mahi Chandra Miri, among others. 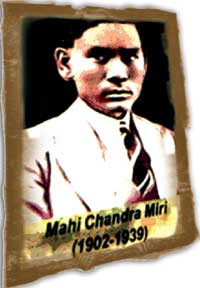 Sonadhar Senapati was highly impressed with the personality of Miri who was a promising youth and ultimately became his eldest son-in-law in 1932.In 1929 Mahi Miri along with Madhab Bhattacharjee was selected for Imperial Forest Service and sent to Rangoon for training in the Forest College there. They were the first Assamese selected for covetous Imperial Forest Service. Of course, an ex-Cottonian Jyotirmoy Banerjee was enrolled in the Imperial Forest Service but he did not belong to Assam. After training at Rangoon, Mahi Miri was posted at Guwahati in 1931 as extra assistant conservator of forest.In 1932, Sonadhar Senapati’s eldest daughter Indira, who was then one of the handful of lady graduates of the depressed classes, was married to Mahi Chandra Miri in the face of serious social persecution. Such inter-caste marriage was unheard of in those days.Like his farmer father, Mahi Miri too was a great patron of learning and that was why he financially helped the poor and backward but promising Mising students with financial help so that they could pursue their studies in right earnest.Around 1934, Mahi Miri was transferred to Bagari range of the then Kaziranga game sanctuary with headquarter at Golaghat. Miri was entrusted with the challenging task of surveying and organizing the sanctuary. Immediately after his arrival, Mahi Miri made his temporary camp at Bagari, being a convenient place to look after the game sanctuary. AJ Milroy, a veteran British forester whose contribution for the preservation of Assam forest and its wealth was immense, was instrumental in deputing Miri to Kaziranga. Milroy is credited to have compiled a valuable book named Game Preservation in India: Assam, published by the Bombay Natural History Museum in 1934. It was Milroy who stopped the indiscriminate poaching of rhinos and elephants in Manas Reserve Forest in the 1930s by placing a platoon of Assam Rifles there. It was also Milroy who opened for the first time Kaziranga to visitors in 1938, when Mahi Miri was very much present in Kaziranga Reserve Forest. In this connection, I would like to mention the name of Englishman late EP Gee, a great naturalist. A Cambridge graduate, Gee joined Assam Tea Company as a manager in the early 1930s. His famous book Wild Life of India is accepted as a scholarly treatise on the fauna of India. It was Gee who introduced a scientific approach to wild animals. Both Miri and Gee appreciated each other so far as Kaziranga was concerned and both of them possessed scientific approach to the wild.When Mahi Miri joined Kaziranga it was “all swamp and leeches”. EP Gee wrote that even elephants would not venture there. Gee also mentioned that the sanctuary got a facelift due to the energetic leadership of Milroy and Mahi Miri. When Miri joined at Bagari the sanctuary was virtually inaccessible without any network of roads, etc. Miri’s presence in Kaziranga was a meteor-burst. He found dozens of empty makeshift thatched shelters of poachers scattered on the banks of the beels inside Kaziranga where poachers reigned supreme. Miri by virtue of his constant vigil and tremendous labour could put a check on poaching. He used to get up at dawn and then kept vigil on the sanctuary on elephant back to check poaching. He used to sit on top of a nearby hill of Karbi Anglong district equipped with binoculars and no sooner did he see poachers, he rushed on elephant back to catch them and sometimes at the risk of his own life. In the 1970s that hilltop was named after him as ‘Mahi Miri Tower’. Indira Miri, wife of Mahi Miri, once told me that when he served at Bagari range once his British DFO, who came from Jorhat, rudely behaved Miri for no fault of his. Since Miri was a man of honour and principle, he at once wrote his resignation letter and handed it over to the British DFO. The latter realized his fault and apologized to Miri. Chandra Phukan, the celebrated actor-dramatist and mouzadar of Kuthori mouza, who was also a wildlife lover was a close friend of Miri. Both of them were multifaceted men in their respective fields. The neighbouring villagers loved Miri for his helping hand in the hour of their need. He also helped the marooned people when the scourge of high flood was the annual feature.In those British days, the officers of the British Imperial Services were allowed to avail Furlough (long leave of absence on half pay). It was usually availed by those officers who served in inhospitable areas. But Miri refused to avail Furlough for the sake of his dear Kaziranga, come what may.Because of his inhuman labour in the inhospitable place like Kaziranga, he caught the dreaded black water fever and got treatment at Golaghat. But alas! Miri succumbed to the disease, leaving behind his young wife and three kids in 1939. In Mahi Miri’s death, conservator Makernes Sahab wrote: “We have lost the jewel of the forest department.” EP Gee’s appreciation of Miri was equally eloquent: “The man who put Kaziranga in the world map, I have talked to the forest officer, who was the first to be deputed to survey Kaziranga in the mid-thirties. He found poachers’ camp at every beel (small lake) and 40 carcasses of rhinos with horn removed... The first two years of Bagari were really tough for Miri. He used to get up at 3 am in morning and go to round the area to check poaching on elephant back... After the illegal shooting was brought under control to some extent, Miri shifted his HQ to Golaghat. For some time, he was posted as DFO at Jorhat. During this time Miri caught the first live rhino in Kaziranga and sent it to the USA. Towards the end of 1938, he came back to Golaghat and met with the premature death on July 29, 1939...”To quote the words of Sir Surendra Nath Banerjee, Miri was, “a man amongst men, a prince amongst his peers.” His life was a blighted genius, the fruition of which would have enriched the world of fauna. Indeed, a light is extinguished and a great voice is hushed into silence. Mishing Renaissance is grateful to Ramani Kanta Deka for this valuable work on one of the greatest Mishing personalities! It was great to know of him-- keep it up! 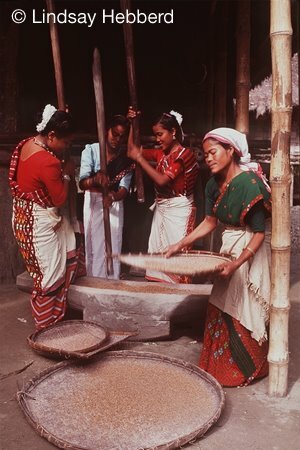 tani e tani ayangem kindak.uttam pegu sar bi aro taniye,mising taniye.bikkeki se site sem ka:pa:dung.do:nyi-po:lo bi turyar molangka.irroi.